If you have been following our Intel Xeon D-2100 Series Launch Coverage Central you will have seen that we already published the expected Xeon D-2100 series OS compatibility list. Usually, VMware is one of the laggards in terms of hardware compatibility for bleeding-edge platforms. Conversely, Microsoft Windows and Linux tend to have leading compatibility of server parts. As a result, we wanted to take an opportunity to test the Intel Xeon D-2100 platform, based on a Supermicro X11SDV-4C-TLN2F, with VMware ESXi 6.5u1. We made a short, sub 2 minute, video of our results. In the video, you will see that indeed, this worked without an issue. We made the recording using an older ISO, from August 2017, just to ensure that there has not been an update since then. 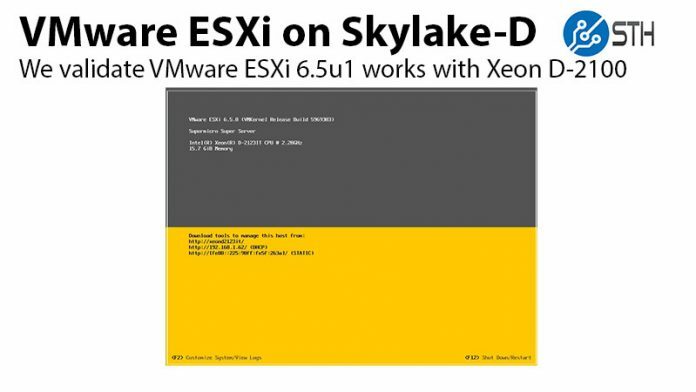 The VMware ESXi 6.5u1 was the first iteration to fully support Intel Xeon Scalable and AMD EPYC which is why it is becoming popular in data centers and labs. At the start of the video, you can see the machine running Ubuntu 16.04.3 LTS prior to installation. In essence, while recording we realized that we covered Ubuntu compatibility inadvertently. Ubuntu was installed without a single additional driver needing to be added, and we have both GUI and server versions running on the Supermicro X11SDV generation platforms. We wondered why we did not need to install an additional set of drivers, and the reason quickly became clear: Intel did something very smart with this generation. At the heart of the platform’s I/O is Lewisburg. If that sounds familiar, it is because the Lewisburg generation of PCH is what was introduced on the Intel Xeon Scalable series of mainstream server processors. 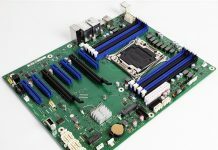 For those deploying these embedded platforms, it means that we expect broad out-of-box OS support for the Intel Xeon D-2100 series platforms out of the gate. That is not something we always see with new embedded platforms, such as the Intel Atom C3000 series. Now, the question remains, if you are working with VMware ESXi virtualization solutions is the Intel Xeon D-2100 series the right platform. We think there is a place for it in highly space-constrained situations or those that require low power, low memory capacity, and high compute performance. You can check out our Platform Power Consumption and First Benchmarks of the Intel Xeon D-2100 Series and we will have lots more on STH in the near future. Can ESXi 6.5 u1 run on Intel W-processor? Thanks Patrick. Any chance you could post up IOMMU groupings?